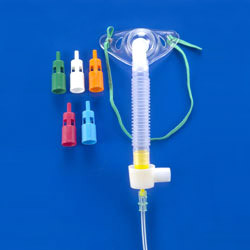 Tracheostomy mask with six color coded diluter, diluter cup, reservoir, and 7 ft. oxygen tubing. 1． Cat. No. 0045 adult tracheostomy mask plus six color coded diluters, diluter cup, reservoir, and 7 ft. oxygen tubing.